I have seen lots of YouTube videos stating about Nibiru. They say, that Nibiru is approaching towards earth. Few of the videos claim, that space maps (Google) hide Nibiru with a black patch. Few years back, I surfed Google Earth and other space map websites in which they actually hide some objects with a black patch. I am sure those were not Nibiru because there were nearly 2 to 3 which I checked with my own efforts. Is Nibiru real or fiction? Nibiru, a purported large object headed toward Earth, simply put - does not exist. There is no credible evidence - telescopic or otherwise - for this object's existence. There is also no evidence of any kind for its gravitational effects upon bodies in our solar system. The nice thing about astronomy is that everyone can do it. You don't have to rely on Google or anyone else, you can just put a telescope in your backyard and start searching the heavens (or specifically, aim it at those black patches you found in a star map). "NASA is confident that it has discovered and cataloged all near-Earth asteroids large enough to cause significant global damage and determined that they are not on collision courses with Earth," the report says, while noting that this does not necessarily include faint comets on the outer reaches of the solar system. (The report does not address the odds of such a comet impacting Earth.) NASA officials also said today they believe they have found 95 percent of near-Earth asteroids more than a kilometer wide. 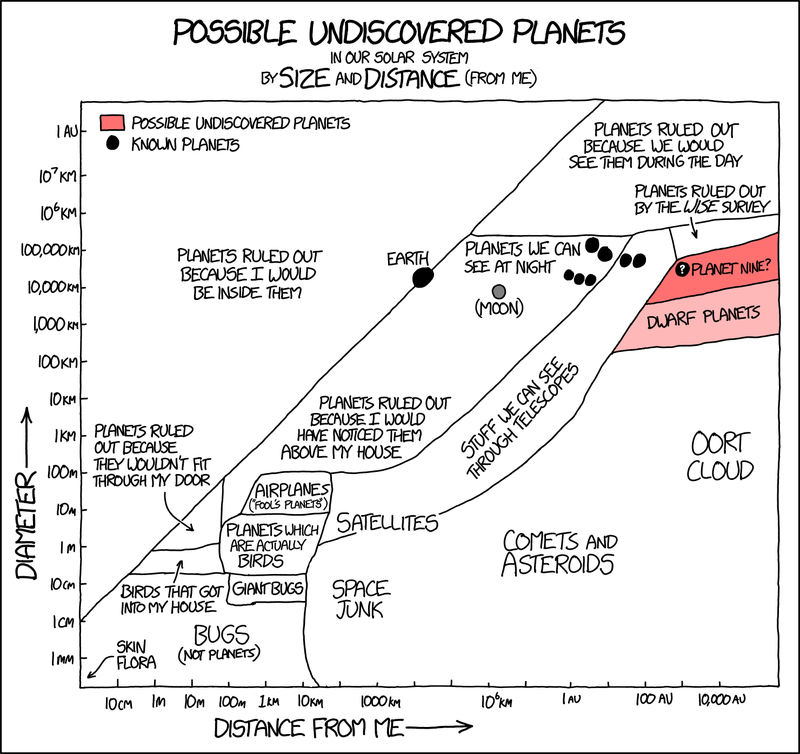 Any planet closer to us than Pluto would have been found multiple times by now. This chart gives a good overview of which objects in the solar system we can see with current technology. The tiny corner at the top left contains the only objects in the solar system we haven't discovered yet because they are a combination of too small and too far away to detect for now. The name Nibiru does appear in science fiction. However, the stuff to which you refer is not science fiction. It's just baloney, malarkey, or "fake news." A viral marketing campaign for Sony Pictures' 2009 film 2012, directed by Roland Emmerich, which depicts the end of the world in the year 2012, featured a supposed warning from the "Institute for Human Continuity" that listed the arrival of Planet X as one of its doomsday scenarios. Mike Brown attributed a spike in concerned emails and phone calls he received from the public to this site. Danish filmmaker Lars von Trier drew inspiration from Nibiru for his 2011 apocalyptic film Melancholia. It also was said to made a cameo appearance in the 2013 film Star Trek Into Darkness, where it is a volcanic planet. See also Space.com's article 'Doomsday Planet' Nibiru Has Cameo in 'Star Trek Into Darkness'. You can read more about references in the Star Trek Into Darkness film in this SciFi SE answer and in this SciFi SE question. However, the much wider and noisier references to "Nibiru" in YouTube and various websites is not science fiction. It is baloney, purported to be truth, and thus "fake news" as it poisons the well of the public's understanding and is meant to generate both clicks and confusion. The difference between real science fiction and "fake news" is day and night, and so the other answers have also elected to find better terms for this nonsense than "science fiction". To resonate with @Hobbes general characterization: Nibiru is contrived nonsense. Ignoring the fact that previously announced dates for the Earth cataclysm have come and gone with no such mayhem, some adherents to the Nibiru cataclysm theory cling to the possibility that it is planet-sized, but so far out in the solar system that we haven't seen it yet. Nibiru adherents claim its particular orbit explains why we haven't seen it yet. But my friend and colleague Mike Brown, a Caltech professor who leads a team that has found many Kuiper Belt objects, gives multiple reasons such an orbit is unstable and the object wouldn't be around for long. Konstantin Batygin's and Mike's suggestion that there is evidence for a ninth sizeable planet in the solar system generated a lot of media attention, but this object doesn't visit the inner solar system. If it had, with its giant-planet-sized mass it would have seriously perturbed the terrestrial planets' orbits, and the inner solar system would appear very different from what we actually see. The wikipedia page on Nibiru covers most of the insanity (and I mean that literally) pretty well. It is not real. There is no rogue planet out there waiting to cause havoc on Earth. It hasn't been there for the last 20-some-odd years that people have been talking about it. It started in the mid-90s with a woman named Nancy Lieder who claimed to be receiving telepathic communications from a race of aliens called Zetans (so named due to being from or near Zeta Reticuli). She started a web site named ZetaTalk (not linking it because you don't want to go there) to relay these communications, and to host discussions on the fringiest of fringe theories (ancient aliens, chemtrails, and general X Files stuff). Nancy herself only called it Planet X - others took the name Nibiru from the writings of Zecharia Sitchin, who believed Earth was visited by aliens thousands of years ago based on writings from ancient Sumer. A member of the ZetaTalk community, Mark Hazelwood, wrote a book on Planet X/Nibiru titled Blindsided: Planet X Passes in 2003. From there it's passed into the general conspiracy theory zeitgeist, and is used by the black helicopter/"9/11 was an inside job" crowd as another talking point in the whole "the gummint is hiding things from us" discussion. Yes, the government is hiding some (genuinely classified) things from us. Nibiru isn't one of those things. It couldn't hide Nibiru from us if it wanted to. Too many people own telescopes and watch the skies - if a rogue planet were truly making its way through the solar system to menace Earth, we'd know about it. More importantly, we'd have known about it in 2003 when it was first predicted to appear. It got a bit of a revival as 2012 approached, which was supposed to be the end of the world based on the end of the Mayan Calendar (because everybody's car explodes when the odometer ticks back over to 000000). Obviously, the world didn't end in in 2003 or 2012, and it's not going to end due to a rogue planet that nobody can see. But, since the best evidence of a conspiracy is a complete lack of evidence for a conspiracy, people still claim it's out there. Not the answer you're looking for? Browse other questions tagged debris interplanetary or ask your own question. How are space agencies coordinating their science missions internationally? Given limits on acceleration for human space flight, what are the minimum travel times in our solar system for real powered journeys?